Our pastor had the joy of joining Rick Bell and Diane Sancken in holy matrimony at Big Cedar Lodge, Ridgedale, Missouri. They are members of an LC-MS congregation in northern Illinois and received all their marriage counseling there. Then, wanting to be married amid the beauty of the local area, the actual marriage rite took place locally. This is the marriage sermon that our pastor preached at their wedding on September 27, 2014. Rick and Diane, imagine deciding to get crazy and go on a honeymoon to some part of the world that neither of you has ever visited. You go to some nook in some faraway land where artisans still weave tapestries by hand, using time-honored methods passed down from generation to generation. There, you find an elegant, beautiful tapestry with radiant colors and exquisite patterns. You buy it, and it becomes a treasured keepsake. Over the years, it even becomes a metaphor, a picture, of your delightful marriage and life together. But one day, you come home and find that honeymoon keepsake torn into many pieces. Stunned, you survey to damage. Did that treasure become many smaller beautiful tapestries from the one you had cherished? No, it had become a chaos of fibers scattered on the floor. The tapestry of what was meant to be has been brought to ruin. Instead of beauty, you now have destruction; instead of fibers coming together to form a marvelous purpose, you now have madness. Rick and Diane, God has called you to live your lives as one, amid a world of chaos, not letting the world turn you into a tattered fragment of what once was. God calls you to be one in marriage, like the Church is to be one in Christ. 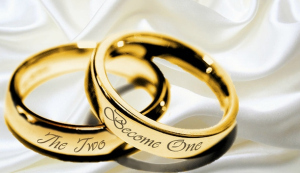 After all, when God joins you in marriage, you are no longer two, but one flesh. God has called you to live in love; each to serve the other as Christ serves you. Our lives today are often coming apart at the seams–but God still calls you to be one. Today, you celebrate the beginnings of this blessed unity. But what is the Source of that unity? It is Jesus Christ; He is the end-all and be-all of your unity. Jesus is the Founder and Finisher of your faith, even the fullness of what your faith is meant to be. Through the Spirit that God has sent, Jesus starts, keeps, and finishes the faith that He has given you, the faith in you, the faith lived through you. As Christ continues to shape and form your marriage, it lives out–although imperfectly–the self-sacrifice of Jesus Christ. The infinite God contained Himself in the finite of human flesh. He took on flesh and blood, and Jesus became man and lived among us, all so He could sacrifice Himself to save you in both body and soul. Self-sacrificial love conforms to God’s commandment to love your neighbor as yourself. And your first and closest person whom God has given you to serve is the other: Rick, for you that’s Diane; Diane, for you that’s Rick. And so God has called each of you to serve in such a way. That’s what’s at the heart of the marriage vows you will speak. You will vow to love and serve the other. Your vows are not to feel a certain way. Marriage vows are not pledges of emotion but promises based on outward actions. Before God, I will ask you what you intend to do, not what you will always feel, for love is an action verb. Rick, will you have Diane as your wife? Diane, will you have Rick as your husband? Will you remain with each other, even unto death? Your vows mean that you will live for the other through sickness, poverty, mood swings, quarrels, household chores, and a leaky roof. God said, “It is not good that the man is alone” (Genesis 2:18). And so He created a companion at Adam’s side. And so God teaches us that a marriage is for companionship. Both of you realize this. That’s why you want to get married. And since God has called you to be one flesh, one without the other is like the head without its body, fire without its heat, water without its wetness, and the sun without its light. In a marriage, God calls you both the serve the other. But how God calls and teaches you to serve the other is different from what the world teaches. Rick, greater love has no husband than this: that he lay down his life–and live his life–for his wife. Rick, that is the love to which God calls you, a love that is good and godly, a love that sacrifices for Diane, which grows out Christ’s sacrifice for His Church. Diane, God has called you to receive, treasure, and return such godly love from Rick, for you are bone of Rick’s bone and flesh of Rick’s flesh. You become the Eve to your Adam. Diane, you make Rick complete, for you are the body to his head. To submit to your husband is to recognize his sacrifice for you, accept his work for you, and cherish his life and limb given for you. That’s what it means to submit–when you see marriage as a picture between Christ and His Bride, the Church. But a marriage is even more than that. It is also for your salvation. As you struggle through life, it’s easy to wander off God’s narrow way, to let the flashing lights of this world distract you, and lose your faith. And so it is as Scripture says, “Better two than one alone, for their partnership yields a good reward” (Ecclesiastes 4:9). And what better way to serve than to keep calling the other back to the faith. When you serve in such a way, each of you then becomes the face of Jesus to the other, each urging the other to receive Him in the gifts of Word and Sacrament. Marriage is a journey through ups and downs, through sorrows and joys. And when the sorrows overwhelm, remember that God is with you, even in the person of your spouse. For that’s how God works His will in our lives–through others. Diane, Rick will help you carry your crosses. Rick, Diane will help you carry your crosses. Recognize the Christ in each other, so you don’t have to bear the weight of this world alone. Jesus is with us always, as He has promised. But He is not with us in some abstract, distant, and far-reaching way. Jesus comes to us in real ways: the preached Word and the Sacraments, especially the Lord’s Supper, where He gives us Himself in His body and blood. But He is also with you in each other. How so? Isn’t Jesus in each of you, each of you into whom the Holy Spirit has breathed the breath of faith? Of course, He is! And what does Jesus do? He saves. God’s salvation for you is a mystery that we may never fully understand. But this we do know: God saved you 2,000 years ago when, in the Person of Jesus Christ, He became sin for you. He did this so you could become the righteousness of God (2 Corinthians 5:21). But God’s salvation for you is not only some event in the past. He even continues to save you now, keeping you in the one, true faith as He comes to you in Word and Sacrament. That’s why Jesus commanded baptism, teaching, preaching, and the Lord’s Supper as permanent fixtures for His Church on earth. But get this: salvation is also a future event. That’s when God will save you on the Last Day, when He will reunite your body (then sinless and perfect) to your soul. God will welcome you into His kingdom, in body and soul, and say, “Well done, my good and faithful servant” (Matthew 25:21). Rick and Diane, God has brought you together, so each may love and serve the other. And this loving and serving goes on, with ramifications even into eternity. So, speak the Word of Christ, the One who is the Word, to the other. As He has promised, His Word will not return empty, but will do what He has sent it to do. Each of you is to be and bring Christ to the other. Each of you is to serve where God has placed you to serve. Rick, Diane, your calling is to keep each other strong in the faith, where Christ will continue to come and save you, yes, even each through the other. Never lose sight of the purpose of your life together: it’s not just for companionship, it’s also for the salvation of your body and soul. God loves you so much that He has given you someone to call you back in the faith when you are tempted to wander. Yes, friendship, the marriage bed, companionship: these are valuable and pleasing in our lives, even blessed by God. But nothing, nothing, is more precious than your salvation. Diane, that’s why God brought you together after years of being single. Rick, that’s why God brought you together while you were still grieving the death of your wife. God brought you together, not just to love the other, as good as that is, but also for your salvation. That’s how much God loves you. Amen.